With the National Judicial Council (NJC) Committee on the Monitoring of Corruption Cases set to commence sitting, it has resolved to produce new practice directions that will fast-track the trial of cases involving corruption and financial crimes. NJC's Director of Information, Mr Soji Oye, in a statement Sunday said the committee took the decision after its meeting in Abuja last week. Oye said the committee has also concluded plans to meet with the Economic and Financial Crimes Commission (EFCC) and the Independent Corrupt Practices and Other Related Offences Commission (ICPC) in furtherance of its mandate. Also, NJC announced that the Chief Justice of Nigeria (CJN), Justice Walter Onnoghen, has directed all heads of court to designate courts and judges that would solely handle the on-going trials on a daily basis in order to fast-track all the pending corruption cases. The practice directions sub-committee of the committee has already commenced a review of various practice directions of the courts by leveraging on both local and foreign comparative jurisdictions to meet global best practice. The committee said it was imperative that other critical stakeholders buy into the mission of the body, saying that regular updates and advocacy postings on activities of its sub-committees must be a permanent feature of the project. 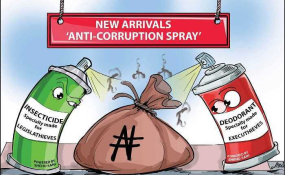 The NJC added that the 2,306 on-going corruption cases nationwide had already been submitted to the committee. However, some chief judges of state high courts were yet to transfer such cases to the CJN for onward transfer to the committee. "Chief Judges of State Divisions who were yet to submit the list of alleged corruption cases to the committee are reminded to do so without delay," Oye said in the statement. The committee directed its secretary, Gambo Saleh, who is also the NJC secretary, to write to the defaulting chief judges. To facilitate its work, the committee was divided into four sub-committees. The sub-committees are Practice Directions, Training, Feedback and Engagement, and Awareness. After Justice Ayo Salami (rtd) had rejected the chairmanship of the committee, Justice Suleiman Galadima, who recently retired from the Supreme Court, was appointed to replace Salami. The committee also divided the country into three zones for ease of monitoring and evaluation of the said cases. The zones are: Zone A - Abuja FCT, Zone B - Northern Zone and Zone C - Southern Zone. At the last count, Zone A in Abuja had 554 pending cases, Zone B had 347 cases while Zone C had 1,405 cases. The committee, after brainstorming on all the pending alleged corruption and financial crime cases submitted to it by the Heads of Court that had complied, further indicated that new practice directions would be issued to judges handling the said cases. No date has been fixed for the planned interface with the anti-corruption bodies. Copyright © 2017 This Day. All rights reserved. Distributed by AllAfrica Global Media (allAfrica.com). To contact the copyright holder directly for corrections — or for permission to republish or make other authorized use of this material, click here.